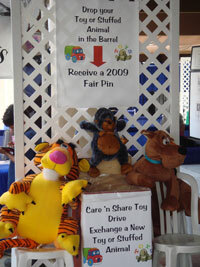 From its humble beginning of 150 stuffed animals collected in a wooden toy bin at the 2009 San Diego County Fair, the Care 'n Share Toy Drive has to date distributed over 30,000 new and gently used stuffed animals to help put smiles on the faces of sick children in the region. In 2012 alone we collected, processed and distributed over 10,000 stuffed animals thanks to a most generous donation from local retailer Real Gifts and the volunteer-staffed booth and collection bins at the San Diego County Fair. In 2015 many of the SD County Libraries hosted collection bins and our collections were over 8,500. Recipient organizations include Rady Children's Hospital, Hospital Infantil de las Californias, Children's Lifeline, UCSD Flying Samaritans, Armed Services YMCA, 13th Marine Expeditionary Unit of FMARG, UCSD's Alpha Phi Omega Operation Santa, Home Start, and Assistance League North Coast. Over the years we've been pleased to support Girl Scout Troop 8719 and the K-5 students at La Jolla Elementary School and students at Cathedral Catholic High School with their service projects that collected stuffed animals for local sick children. Many thanks to local businesses such as Rock Bottom Brewery, Fit in 60, Rancho San Diego Travel, The Lawton Group, North Island Credit Union, Clone Duplicating & Graphics, and the residents of La Jolla Seville for hosting collection boxes for those who could not make it to the Fair. If you have any new or gently used stuffed animals in need of a new home, we welcome your donation! Please contact Nancy Stoke for further information. 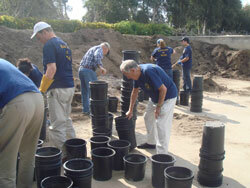 A day to get out in the community and get sweaty and dirty, Torrey Pines Rotary Club always has fun at this event. Traditionally held on the last Saturday of April each year, Rotary Clubs around the world identify a hands-on project that all members can participate in to help the local community and truly demonstrate our motto of "Service Above Self". Our Club has volunteered polishing commemorative plaques at the Mt. Soledad War Memorial and in the Nursery at Balboa Park for the past several years, planting trees and specialty plants used in various places in the Park. As you can see from the photos, a good time is had by all! 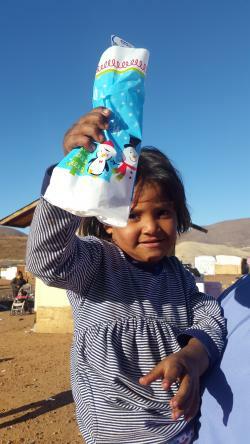 We help brighten the holidays for those less fortunate in a number of ways. For a carefully selected family we can be found buying, wrapping and delivering food, gifts and clothing during the holidays. Always warmly received by the recipient family, it is as rewarding for us as it is for them. In 2015 Jerry Zampa pioneered a new holiday project, working with employees at the local Stater Bros grocery store to identify and quietly pay the grocery bills for store patrons known to be in great financial need. Soon other shoppers were paying it forward and also helping pay grocery bills for others in line. The smiles and hugs were reward enough, and then one recipient came back with several bags of hand-knitted socks and caps that she wanted to pass along to others in need (which we did by getting them to the families living at the Tijuana dump). Truly heart-warming ways we serve those in need in our community. Life at the dump is the pits! Hats off to new member Leilani Sakai for jumping in and leading a successful project to collect hygiene items for the children and families living at the Tijuana dump! In late 2015 we learned from the nutritionist we work with at Hospital Infantil that the 200+ families living at the dump were in desperate need of hygiene items such as diapers, baby wipes, tooth brushes and tooth paste, etc. Leilani quickly put the word out to our members and in two weeks' time we gathered 4,500 baby wipes and hundreds of holiday bags with dental hygiene items along with many more needed items, almost 6,400 in all. When combined with the items collected by our partners for this project at the Living Water Church we were able to deliver over 10,500 hygiene items to those children and families very much in need.